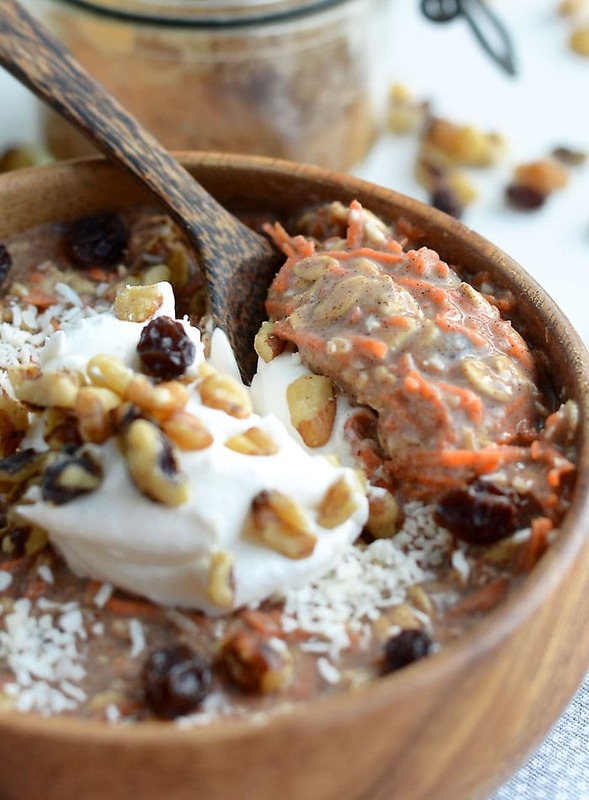 Carrot Cake Overnight Protein Oats | easy, healthy, vegan, delicious! I’m eating carrot cake for breakfast and I don’t care what anyone says! Ok, it’s not quite carrot cake but these carrot cake overnight protein oats are close enough for me. They taste amazing, are high in plant-based protein and provide plenty of energy for an active day. 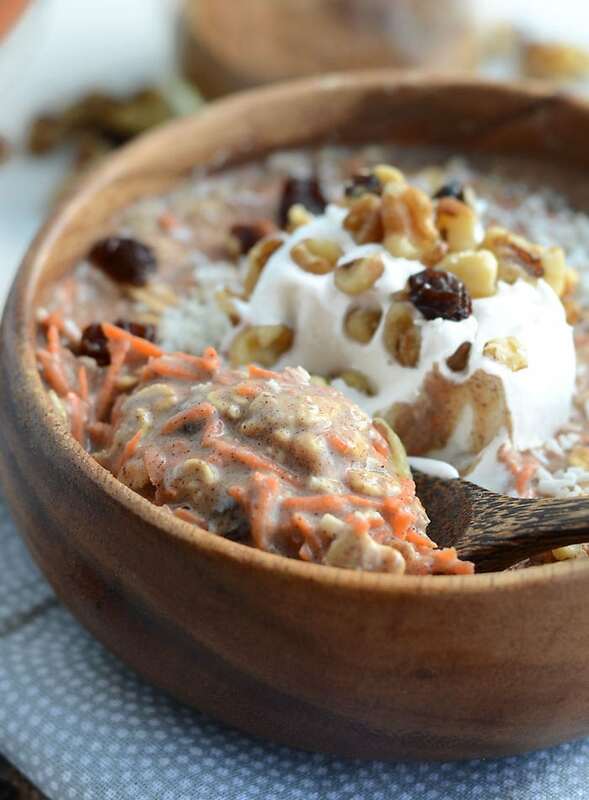 You only need a few minutes to prep them then evening before and in the morning you’ll be digging into delicious, sweet and satisfying carrot cake oatmeal. Sadly, most people don’t eat enough vegetables so if I can find ways to sneak raw veggies into easy recipes, I’m gonna do it! 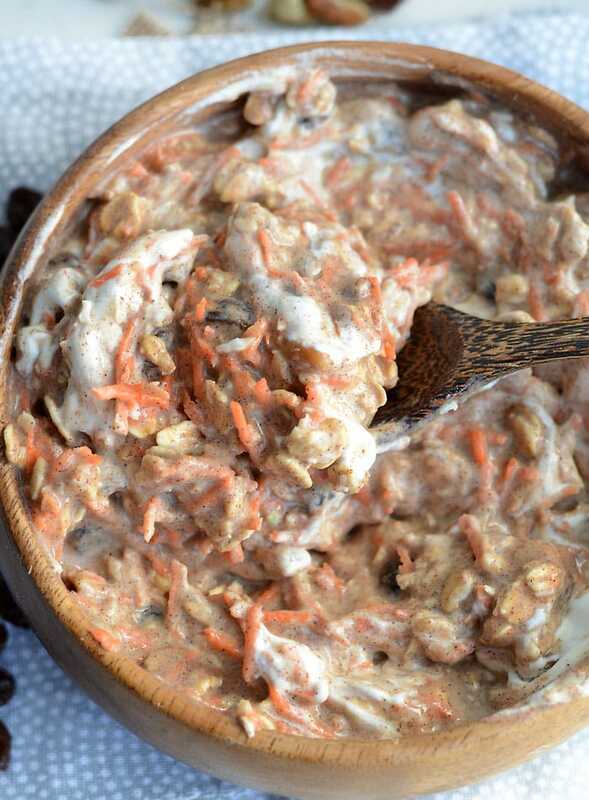 I love adding carrot, zucchini, pumpkin, squash and even cauliflower to my overnight oats. All these veggies blend in nicely so you can’t really taste them when added to oatmeal. I like the texture and volume they add without the extra calories, plus they all add their share of nutritional benefit along with the extra volume. Here are a few options for adding veggies to your oats! 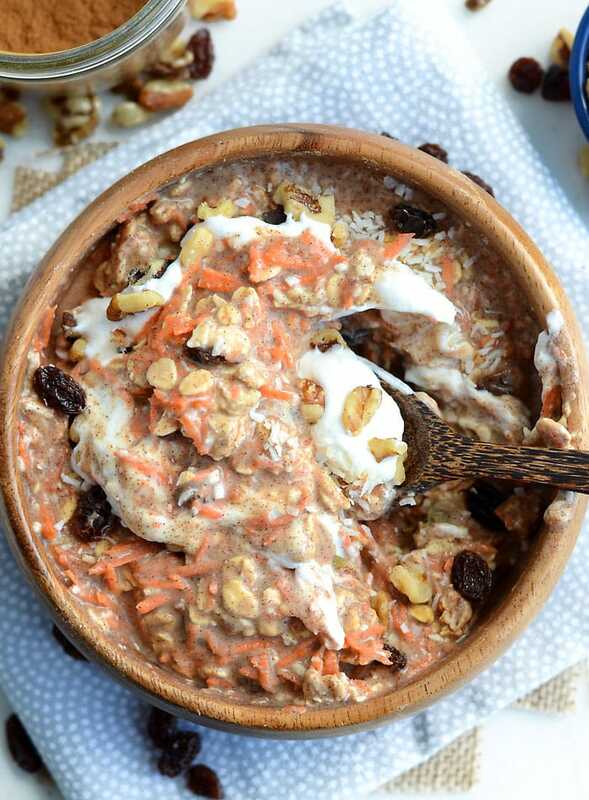 Carrot cake overnight oats are one my favourite variations of oatmeal. Well, these and my Brownie Batter Overnight Protein Oats are both up there for sure! You can make these with or without protein so check the recipe variations listed below. Most days I don’t use a recipe, I simply toss all my desired ingredients in a jar, top it with almond milk and stick it in the fridge. They takes all of about 60 seconds to prepare, that’s what makes them so great! Check out the video below of how to make them, it’s so easy and they seriously taste amazing! I love making them with light coconut milk like I did in the video, it really takes them to the next level. I topped the ones in the video with raisins, walnuts and coconut plus some coconut yogurt and a drizzle of pure maple syrup. I shared a bunch of my favourite overnight oat variations in this post and I’ve posted number of delicious overnight oat recipes on the blog already, Berry Coconut Overnight Oats and Chocolate Chip Cookie Dough Oats to name a few! There are just so many ways you can make them they never get old. Dig into these wholesome, nourishing and satisfying oats with the added bonus of extra nutrition from the carrots. 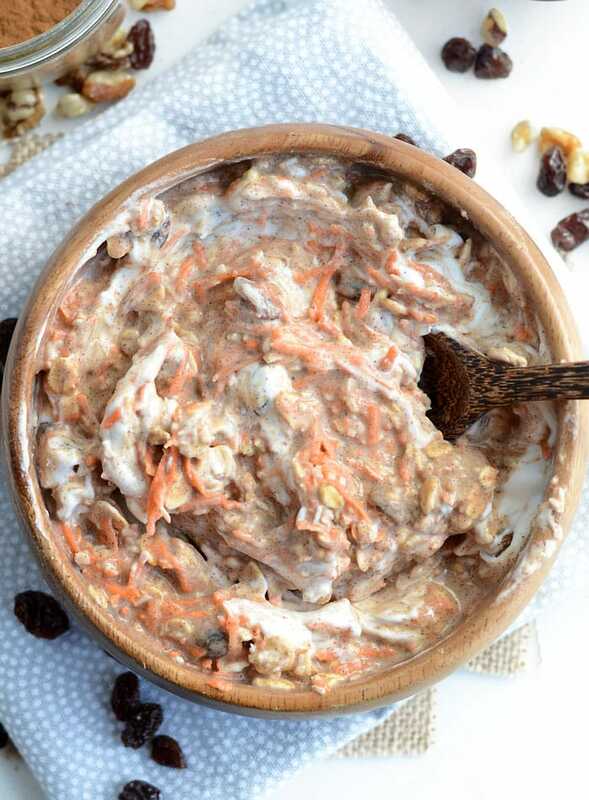 These carrot cake overnight protein oats are high in protein, packed with nutrition and take just minutes to prepare. Prep them the evening before to wake up to carrot cake for breakfast! Try them with your favourite toppings such as coconut whipped cream, pineapple and walnuts. Add the almond milk to a container, jar or bowl. Add the rest of the ingredients and mix well to combine. Leave out the protein. It’s up to you but I like the flavour, texture and nutrition that Vega Performance Protein in Vanilla adds. If you’re leaving out the protein, use a touch less almond milk. Switch up the add-ins. Feel free to mix and match the add-ins I used, omit any or increase the amounts or try additional toppings like coconut whipped cream, dairy-free yogurt, walnuts, almonds or pineapple. Add more spices. I usually just add cinnamon to mine but they’re also good with ground ginger and nutmeg. Use a different liquid. I make these with unsweetened almond milk but you can also use water, light or full-fat coconut milk or any other plant-based milk you enjoy. And I have a bag of carrots that desperately needs using up before it goes off. Yay, breakfast tomorrow 🙂 I’ll probably leave out the protein, as I get enough already, but this looks delicious. Thanks! To add more protein you could use some Greek yoghurt instead of all the milk and it’d be thicker ???????????????? Yes! Sounds amazing. Love those toppings! So happy you liked them! Sounds like an interesting recipe to try … I’ll have to work it into my rotation this week! Definitely! Give them and try and let me know how you like them! This recipe is absolutely fantastic – just like every other recipe I’ve tried from your website! You always create the perfect flavour combinations. I also made your Carrot Cake Energy Balls this evening (I was craving carrot cake haha) and they are excellent as well!! I’ve been reading your blog for a while and I haven’t commented before, but I wanted to tell you how much I appreciate all the great recipes and content you post. I love my oats and cook them virtually every day. I am vegan as well so I am always looking for different ways to add more veggies. Your recipes look great. I plan on trying several of them. 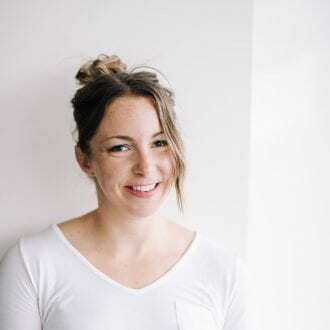 So I’ve been following you religiously since Jan thanks to our mutual friend Michaela Buskell — bless her! I literally never cooked before and have always eaten a ton of meat. Your recipes have made it so easy and have given me the confidence to mess around in the kitchen. I’ve been eating home cooked meals all month – an actual first for me. So THANK YOU!!!!!! Anyways finally made this today and holy s**t!! Could actually eat all day every day! !